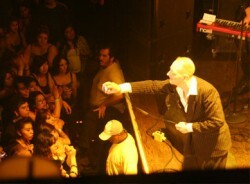 Scene Point Blank recently got in touch with cabaret punk-rockers World/Inferno Friendship Society to play catch up, and just see what's going on with the band. Frontman Jack Terricloth was kind enough to reply with updates on their comic/7-inch combo, their current tour with The Adicts, and upcoming projects. Scene Point Blank: Hey, this is Aaron with Scene Point Blank. Thought I'd check in with World/Inferno and see how things are going. Thanks for taking the time to answer my questions. Jack Terricloth: No problem Aaron, My name is Jack and I'm sitting in a crowded van speeding through Arizona...again. Scene Point Blank: You guys just started your tour in support of The Adicts--how does it feel to be on the road with them? Jack Terricloth: We've been getting along just fine. You drop two groups of lifelong punk rockers into the middle of nowhere every night--there is little else to do but talk to each other sitting outside the fire exit smoking cigarettes. Scene Point Blank: Any plans of sneaking into Disneyland in Anaheim? Jack Terricloth: We had a very hard time not being conspicuous in Disneyland, so sneaking was not really an option. Got pointed at a lot though. Scene Point Blank: The first thing I'm curious about is the status of the 7-inch/comic book you guys were planning on releasing. How did that come about? Jack Terricloth: Our friends at the Silver Sprocket Bicycle Club proposed it after the success of their comic on the popular and well-loved band, The Phenomenauts from Oakland, California. Recording the single is the next plan after this leg of touring forever-everywhere project. Scene Point Blank: Is anyone in World/Inferno comic book fans? If so, what are your favorites? Jack Terricloth: I am, of course, a fan of the artwork, but you know--being an adult--I don't know much about the state of the genre. I do try and follow the work of Michael Cavallaro, whose Parade With Fireworks was excellent. Scene Point Blank: It's no secret World/Inferno have gone through a number of line-up changes. Are there any members you'd like to see return? Scene Point Blank: Who would you like to come in and play or write with you that hasn't yet? Jack Terricloth: Still waiting for that text message from Noel Coward. Scene Point Blank: There have been some band reunions announced recently for bands people never expected to reunite. What do you think of bands that reunite after 10+ years? How often do you think the members' interest in playing together plays a bigger role than the cash-in? Jack Terricloth: If you want to make money the last thing that should ever cross your mind is playing in a band. As a teenager I was in a band called Sticks And Stones, who did a reunion a few years ago, and I can honestly say the incentive was just seeing the guys again. In my dynamic and exciting philosophy, the most noble motives will always get the airtime. Scene Point Blank: Are there any new projects you're working on? Jack Terricloth: Time to start thinking about the next record. I know some bands write on the road, but besides for a few notable exceptions (“Only Anarchists Are Pretty” for example) we never seem to get around to it. Other than that, the Radio series I've been threatening to do since the Peter Lorre show has found a venue, so that'll be my day job for a while. 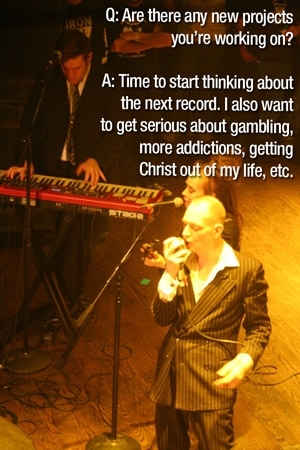 I also want to get serious about gambling, more addictions, getting Christ out of my life, etc. Scene Point Blank: Where will you be when the world ends this year? Jack Terricloth: Exactly where Ii want to be. Scene Point Blank: Do you have any advice you would like to offer to younger bands? Jack Terricloth: Yes. Don't get in drinking matches with your bandmates before a gig. No matter who wins, you all lose. Scene Point Blank: Thanks again! Have a great tour! Words & photos: Aaron H.
Words by Aaron H on March 12, 2012, 9 a.m.
Posted by Aaron H on March 12, 2012, 9 a.m.
Posted Sept. 25, 2014, 2 a.m.
Posted Sept. 29, 2012, 8:46 a.m.
Posted Sept. 9, 2011, 2:43 a.m.